One of the best things about WordPress is that it is easy to customize. And by that – we mean that the first step to this process is the theme. 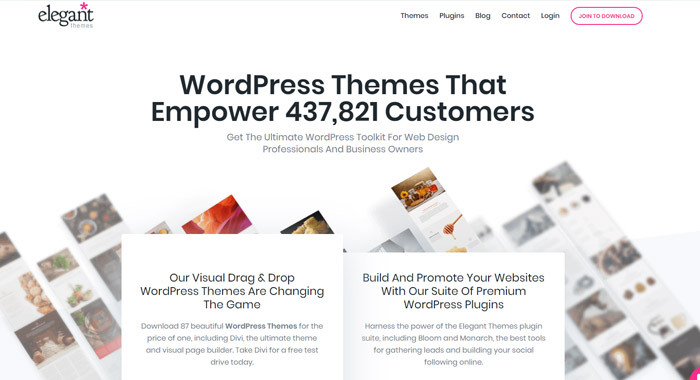 There are literally tons of free themes out there, and even more premium themes that you can use to really customize your WordPress site and make it look exactly like you want it to look. But, having so many options also presents its own unique problem. Sometimes, there are so many choices that finding the best theme for you can be a bit on the difficult side. With so many themes in existence, finding what you want can often feel like searching for a needle in a haystack. Which is exactly why we have decided to help. In this post, we are going to share some of our favorite places to find awesome WordPress themes. 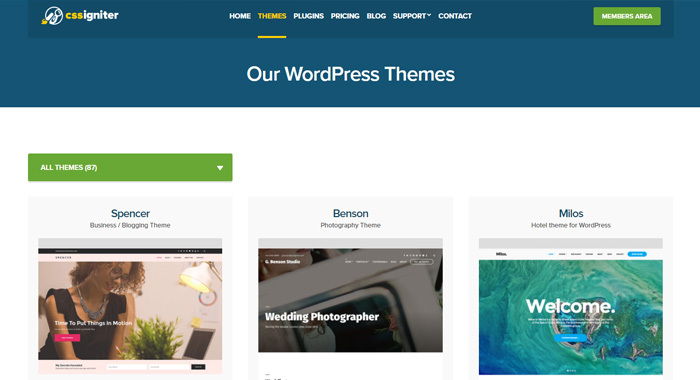 These are not the only awesome places on the web to get WordPress themes… but they are some of our favorites, and we have no doubt that they will at least give you some dynamic options as you search for the theme that’s perfect for your site! Before you begin your search for a WordPress theme, it is imperative to ask yourself a few basic questions. First of all, you should ask yourself what your website is going to be about. Secondly, you should ask yourself what the primary goal of your website is going to be. And thirdly, you should ask yourself how you plan on achieving your WordPress goals. Outlining the answers to these questions can do a lot to help you get off to the right start with a theme that will work the best for what you have in mind. For example, if you want to create an online store using WordPress, then it may do you a lot of good to choose an eCommerce plugin first, and then look for themes that are compatible with it… etc. 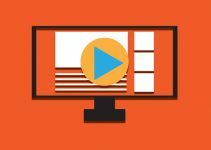 You will also want to think about your content marketing plan, and should also take into account what lead generation strategy you are going to be using. And of course, you will also want to think about what crucial plugins you will need to be using to make your ideas work. Once you have your basic framework/guideline put together, based on the answers to these questions, then you will be ready to pick out a theme, as you will know much better what to look for. 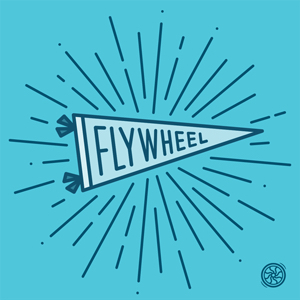 At any rate, here are some of our favorite places to shop for WordPress themes for your new site. 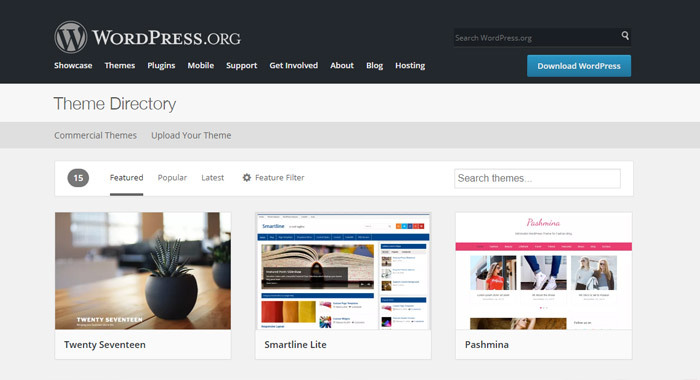 StudioPress is an awesome place to get premium WordPress themes. You can shop for them by category, by features, or by layouts… and you can even buy what they call the Pro Plus All-Theme Package, which is basically a huge package that will give you unlimited access, support, and updates for all of the themes created by StudioPress for the low one-time payment of $499.95. StudioPress is well-known for creating simple themes that include the types of basic elements that you will actually need for the type of site that you wish to create. They are also known for being simple to set up – which is always a bonus! 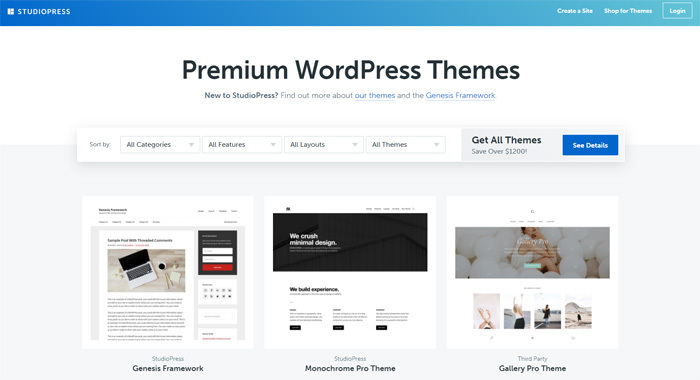 This theme developer offers more than 80 premium themes, and has been in business since 2010 – so they’ve definitely earned their place in the market! They are most well-known for having some of the best themes for businesses like hotels, restaurants, magazines, and the like. Their themes are also very beginner friendly, so you won’t have to worry about a bunch of complicated nonsense to wade through while getting started! Their themes start at about $39 each… but you can join their Lifetime Club for just $199, which gives you access to all of their themes and plugins forever! It’s a super good deal… one of the best out there! 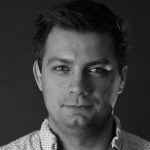 This theme developer has, to date, sold themes to over 430,000 customers… so they certainly have a place in the market and have established themselves as a trusted name in the industry! And for good reason. They are one of the most well-known and oldest WordPress theme shops around. 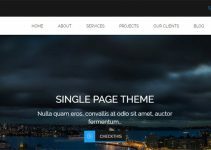 They offer plenty of premium WordPress themes, develop awesome plugins, and even maintain one of the best drag-and-drop style page builders for WordPress that currently exists on the marketplace (The Divi Builder). Plus, they have simple pricing. Just purchase a single membership, and get access to all of their themes and plugins! 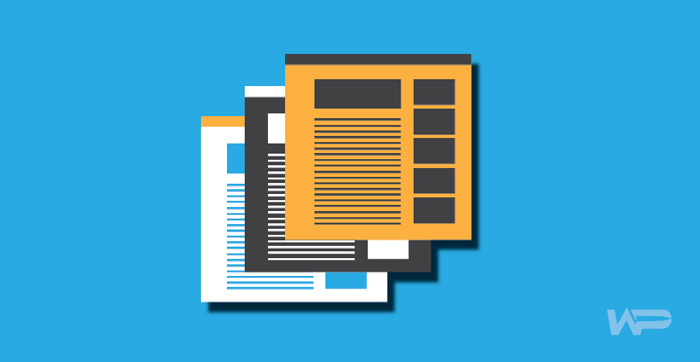 If a free theme is what you need, then the WordPress directory has over 4800 of them! But don’t be fooled. Just because these themes are free does not mean that they aren’t awesome! 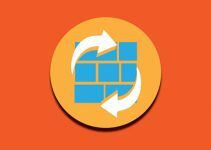 Every theme needs to pass a very careful review process before being allowed on the theme directory… so you can be sure that every free theme here is going to do its job. If you need a basic theme and don’t have a huge budget to get started with, then you can absolutely find what you are looking for here! MOJO offers a wide range of website-building products on their website. 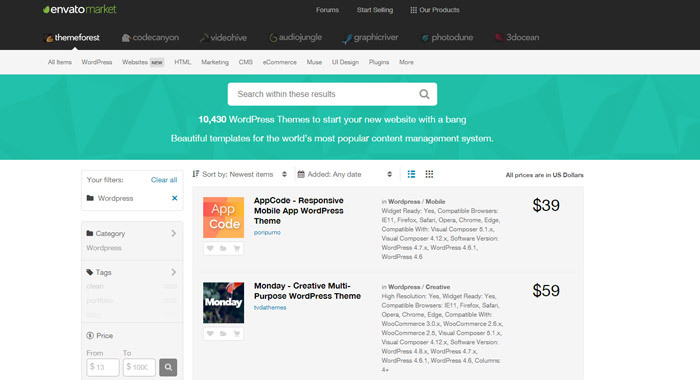 They sell themes for a wide range of different types of sites, including WordPress… and their pricing is quite simple. For a lot of their premium themes, you will pay just $49 for a single-use license. This may seem a bit more expensive than the deals you get on some other marketplaces, but you get a LOT of high quality options to choose from as well. Plus, MOJO offers quite a few plugins that you could use… which is another good thing. 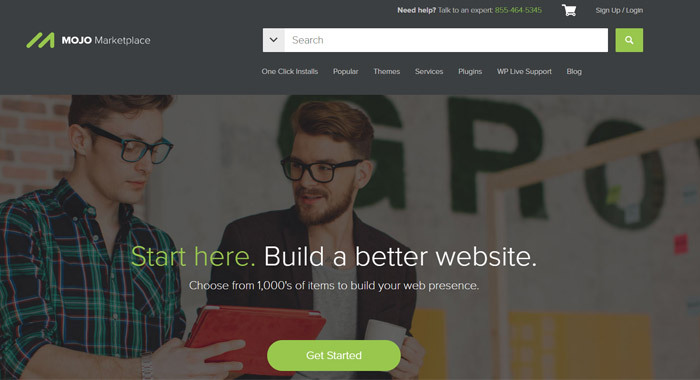 Themeforest is just one name under a much larger group of developers called the Envato Family. 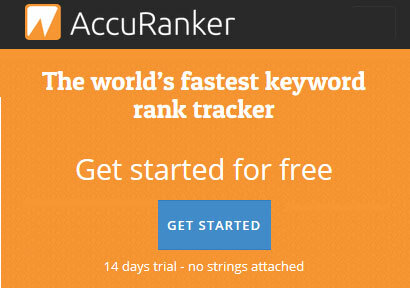 This ‘network’ develops a lot of different support products for websites… including a huge collection of premium WordPress themes. These themes range in price from pretty cheap to ‘pretty premium,’ but they are easy to search/browse through, and provide you with incredibly detailed descriptions of what you are getting for your money. Some of our favorite themes have come out of Themeforest… so make sure to take a look if you are thinking about picking up a better theme for your new WordPress site idea.